Living in the great state of Texas if you’re a homeowner, chances are that you have had at least one insurance claim after a hail storm or you are long over due for your first. Yes, even you Mr. and Mrs. “I just bought my first home”. From the statistics that I have gathered from inspecting thousands of roofing projects in the Dallas / Fort Worth metroplex hail strikes homes on average every 3 or so years. That being said the hail size in Texas and across the country vary widely so not every storm yields the need for a new roof. What to do when hail strikes? The first thing that you, as a homeowner, want to do after a storm hits is get a roof inspection from a local roofing professional. Make sure and interview the roofing company and make a choice that fits your needs and wants. The first issue in Texas roofing is that there is no licensing. To combat this, make sure that you ask very direct questions before letting someone on your roof. Does the company have General Liability insurance? Are they members of the Better Business Bureau? Are they manufacturer certified? How long have they been in business? Do they look professional? There are more roofing contractors formed the days after a storm than there are stars in the sky. After inspection make sure that they give you copies of their inspection photos. If they do not meet the above criteria do not let them get on your roof. If you question their professionalism or company values and you let them inspect your roof anyway make sure to watch the inspection from the ground and be sure they do not vandalize your roof by manufacturing damage. I have been on an inspection after another “professional” looked at a customers roof and have found vandalism that was obviously man made. Use this time to select a contractor that you want to work with throughout the process. A professional roofing contractor can be your biggest advocate throughout the claim process. Once you have determined with your contractor that you have the basis for a claim, call your insurance carrier and file your claim. If you are looking for a Fort Worth roofing contractor we would be honored to serve your roofing needs. Let your contractor know when the adjustment will take place so that they are on the same page with your carrier on the scope of work. Once the adjuster has verified the loss and writes your scope of work they will sometimes explain how the payment process will work. They will use acronyms to explain the detailed estimate they have written with many line items. Make sure that you ask as many questions as it takes to understand what has been covered. Share this scope with your contractor of choice so that they can verify their expected scope of work matches your insurance adjusters. Homeowners and unscrupulous contractors alike will focus on “covering”, “working with”, “eating” the deductible. Plain and simple this is not a legal practice. If you have a contractor start their relationship with you by lying for you it begs the question of how long before they lie to you? In order to get everything on your home replaced to pre loss condition, you must pay your deductible and submit a bonafide true invoice showing the total amount for the repairs. 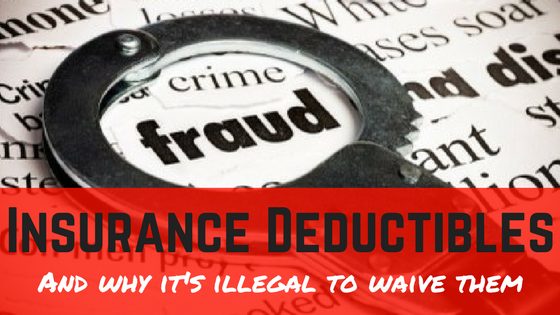 In order to cover a deductible, a contractor is going to send a fraudulent copy of an inaccurate invoice to your carrier. The State of Texas law states “a person commits an offense if he/she presents or causes to be presented to an insurer a statement that the person knows contains false or misleading material information.”. The penalties for an offense are steep for this action. The State of Texas states the penalty for fraud as “a state jail felony if the value of the claim $2,500 or more but less than $30,000”. At the end of the day if one company is $2,500-$4,000 (average Fort Worth Texas Deductible) lower due to this practice are they just making less money? In a simple sense… NO. A quality contractor that replaces your roof properly with quality products will bring you peace of mind and quality workmanship. The unscrupulous contractor will stop at nothing to try to make a job profitable by using the least amount of new materials and reuse or not even remove components that are on the roof currently. At Excel Roofing & Construction we start by taking all of the old felt underpayment off and going down to a clean deck. This allows us to inspect your plywood and be sure it is fastened to rafters properly and that there have been no undetected leaks. All roof components are a system. We replace the entire roof system with new products all manufactured by one manufacturer. We offer extended service policies that will extend your workmanship coverage for up to 25 years backed by America’s #1 Roofing manufacturer, GAF. We are able to do this due to the fact that we are a top 1% Fort Worth Texas Roofing Contractor and designated as a GAF Master Elite Contractor. On top of this fact that we are extremely proud of we are a top 10% GAF Master Elite Contractor having earned a Presidents Club Award for Excellence in Training, Customer Service, and Installation. We are proud to do quality work at a fair price that ensures your #1 asset is protected with the best products and guarantees available on the market. If you are looking for an award winning Fort Worth Texas Roofing contractor call our team at 817-645-1788 for a worry free roofing project.